A specially Thursday-picked Large share, tiny farm flexibility in action for a shareholder who missed the weekend pick-up. A Large is about one and a half the size of the standard Single share. This week: carrot (Touchon), beet (Golden Detroit, Scarlet Supreme), tomato (assorted heirloom), mesclun (9-lettuce), spring onion (Ramrod, Red Baron), summer squash (Sunburst, Golden Dawn III, Ambassador), potato (Gold Rush), pepper (Ace), onion (Stuttgarter), garlic (Music). The shares have been pretty good this year, not over the top (in a superabundant way) as they have been at times in the past, but definitely solid value for the fresh, local, organic dollar! Wow! I’m impressed. Great photo. Too bad our family is many hundreds of miles away, or we’d order a large share! Love the blog and the wonderful use of two acres. Your garden is a model and an inspiration. 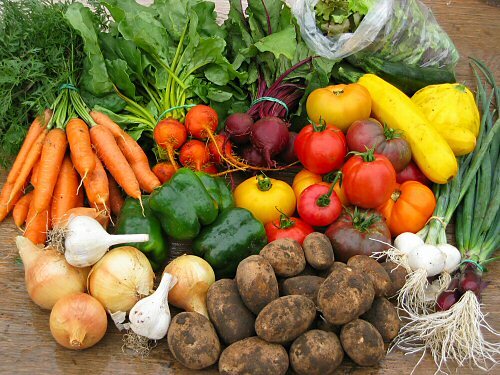 I have just begun to think about the “100-mile diet” (just read “Plenty”) and am beginning to look for a CSA with shares available in the Indianapolis area. I can’t say it enough. Kudos, Great work. I look forward to catching up with all that you are doing and to following your new posts.